What happens when a polar bear and a grizzly fall in love? Something quite adorable. Grolar bears - also known as pizzlies - are a cross between polar bears and grizzly bears and they're utterly charming. Unlike some hybrids, each grolar bear seems to have a unique combination of traits from his parents. Hier könnt Ihr Weibchen Tips (oben) und Männchen Taps (unten) im direkten Vergleich sehen. While the ones shown here live in the Osnabrück Zoo in Germany, grolar bears are a natural occurrence - though they're quite rare. 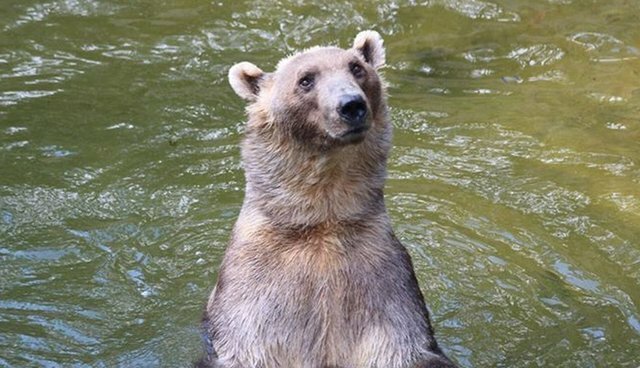 The first DNA-confirmed wild hybrid was found in 2006, unfortunately after he had been killed by a trophy hunter, but stories of oddly colored polar and grizzly bears have been around for years. The hybrids are all the more interesting considering that they're not just the result of a chance encounter. When bears mate it can involve a days-long process of courtship with their chosen breeding partner, including cuddling and spending time together, meaning that the parents likely put quite a bit of thought into it. Wenn Ihr genau hinschaut, seht Ihr, dass Tips eher den Körperbau eines Braunbären hat - das Fell ist aber sehr hell. While some have speculated that grolar bears are the result of climate change, polar bears and grizzlies have been sporadically interbreeding ever since they split off from each other around 5 million years ago, so it's unlikely that it's an entirely new phenomenon. In any case, they're quite adorable. You can see more photos below. Taps, das Männchen, hat eher den Körperbau eines Eisbären - aber das Fell ist dunkler. Schnell angelt sich Tips eine fette Makrele aus dem Wasser, die ihr bei der Fütterung zugeworfen wird.